Paris Weekender - Weekly Get-to-Know-Paris Challenge #12! 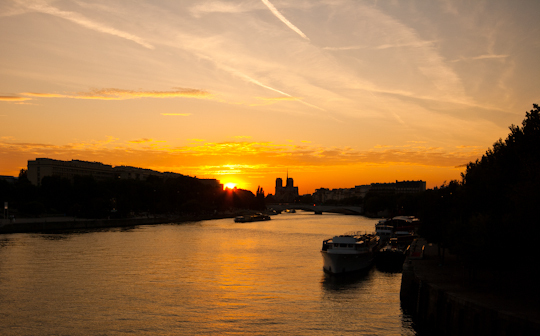 This week’s get-to-know-Paris challenge is to catch the sunset! Bring your camera out with you so you can capture the colors of the sky. Clear skies are not only nearly impossible to find in Paris, they are generally not the best for sunsets either. Having a few low clouds in the sky allows for interesting reflections of light and an array of colors. If you are in Paris, go to one of the bridges over the Seine: I love catching the sunset from the Pont des Arts or Pont Alexandre III. Sacré Coeur is another great place to view the sun setting. And the Carrousel du Louvre gives you a wide open space to maximize your sky view. Depending where you live, your best view may just be out your window! Where is your favorite place to catch the sunset in Paris? If you capture a good sunset shot, tweet it to me @ParisWeekender !